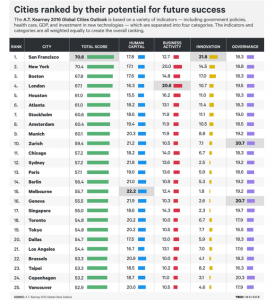 This report ranks over 100 cities based on various factors to determine their current standards and projected potential. Factors included – conferences held, number of Fortune 500 companies, quality and size of the workforce, ability to innovate, the rate of change (ie: patents per capita and various performance metrics), etc. To determine the top cities in 30 years, scores were calculated based on four main categories – personal well-being, economics, innovation and governance. From this, if you or your company is based in one of the locations in the following chart, the organization has an advantage with access to expertise, ability to hire high caliber people, develop thought leadership, be more strategic in decision making, be better at business innovation, have more options to improve outcomes, etc. Conversely, If you or your business is not in one of these locations, then you’ll have to be more insightful / innovative / resourceful, as well as work harder and invest more in future initiatives to compete against organizations having the advantages of being in the cities below.